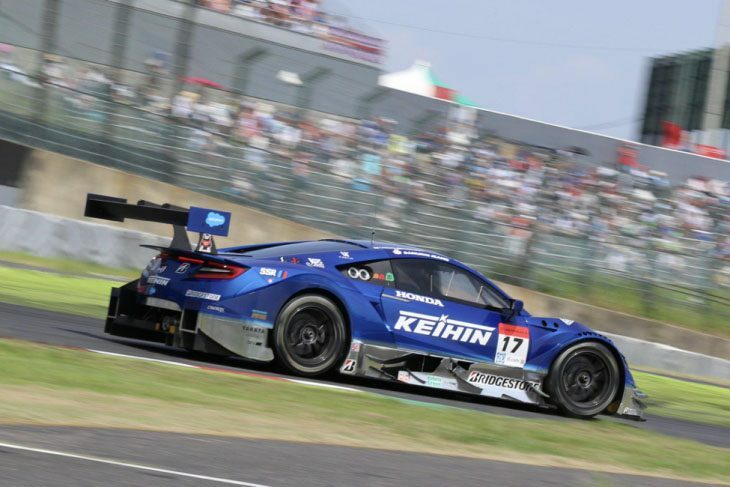 The #17 Keihin Honda NSX-GT of Koudai Tsukakoshi and Takashi Kogure has dominated the 46th International Suzuka 1000km, leading at half distance as the teams prepare to serve the third of their five mandatory pit stops. Tsukakoshi took the lead from polesitter João Paulo de Oliveira’s #24 Forum Engineering Advan Nissan GT-R at the end of Lap 13, and apart from the pit stop cycles, he and Kogure have led the entire race since. 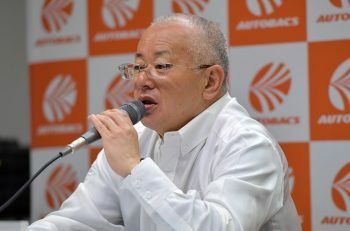 Already the race has seen heartbreak for the likes of Satoshi Motoyama, whose 13th bid for his first Suzuka 1000km win came up unlucky when his co-driver Katsumasa Chiyo got caught up in an unfortunate incident on Lap 15 in the #46 S Road Craftsports GT-R. The race saw a Safety Car intervention on Lap 42 when the #55 ARTA BMW M6 GT3 of Shinichi Takagi got turned around into the sponge barriers at pit entry, leaving them stranded in the middle of the road with a broken suspension. F1 World Champion Jenson Button’s hope of a debut Suzuka 1000km win evaporated when, after taking the wheel for the first time, he was released into the path of other cars coming in for pit stops. The #16 Mugen NSX-GT was hit with a Drivethrough Penalty, and to make matters worse, co-driver Hideki Mutoh went off at Spoon Curve on Lap 84, then picked up a left rear puncture – compounding the trouble for Team Mugen. The #64 Epson Modulo NSX-GT of Bertrand Baguette & Kosuke Matsuura is second, their best performance of 2017 by far, with the #23 Motul Autech GT-R of Tsugio Matsuda & Ronnie Quintarelli having a fantastic day on 82 kilograms of Success Ballast. It’s been heaven for the Toyota 86 MCs in GT300, led by the #18 Upgarage Bandoh 86 of Yuhki Nakayama & Shintaro Kawabata, ahead of the #25 VivaC 86 MC of Takamitsu Matsui, Kenta Yamashita, & Tsubasa Kondo. The VivaC 86 led for the first 30 laps, but a slow pit stop lost them over 27 seconds on track and dropped them behind the Upgarage 86. 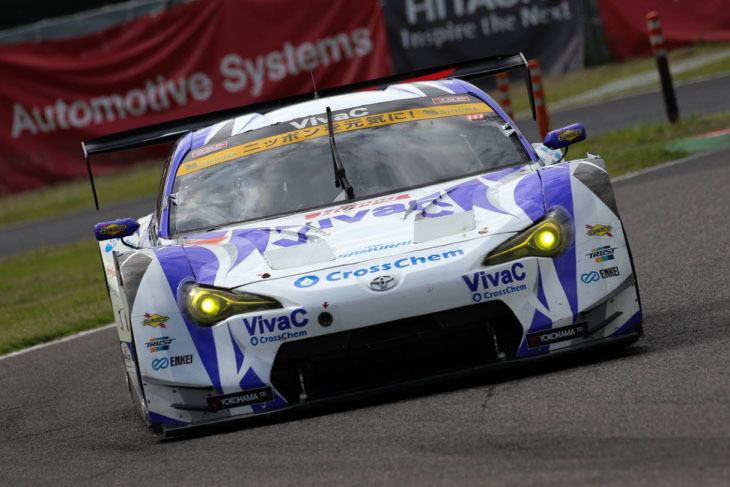 They made up the deficit on their second stop by taking fuel only and double-stinting their second set of Yokohama tyres, and when the Upgarage 86 pitted on lap 74, Yamashita continued on into the lead of the category. 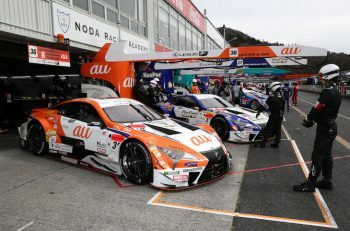 Also in the mix are the two Lexus RC F GT3s of LM Corsa, led by the #60 Syntium LMcorsa RC F GT3 of Akira Iida & Hiroki Yoshimoto. The #65 LEON Cvstos Mercedes-AMG GT3 of Haruki Kurosawa & Naoya Gamou pitted on Lap 1, and have disrupted the running order by going off-sequence on strategy. Images courtesy of Suzuka Circuit.